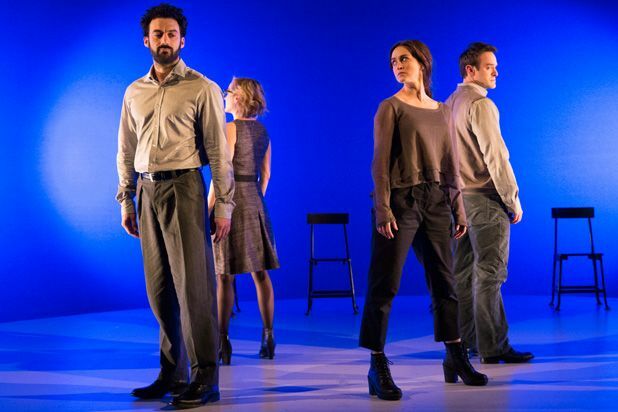 A more apt title for Nick Payne’s new play “Incognito” would be “The Story of Two Brains.” The British playwright’s follow-up to his hugely successful 65-minute sliver of an acting exercise “Constellations” opened Tuesday at MTC’s City Center Stage 1. As titles go, “Incognito” is so slylishly enigmatic, and tells us next to nothing. Also not helpful are the gerunds that make up the titles of the three acts — “Encoding,” “Storing,” and “Retrieving” — even though Payne’s play is only 85 minutes. Scott Pask’s set design — a bare circular stage and cyclorama — telegraphs from the get-go that we’re in for a deep night in the theater. Who would suspect that one half of “Incognito” is a mash-up of plots from a few Joan Crawford movies: an amnesiac musician can no longer play the piano, but miraculously performs again when united for the first time with his long-lost child, now an adult? It’s sentimental, but it’s doubtful Payne wants to be saccharine. “Incognito,” like “Constellations,” wears its intellectualism on its sleeve, meaning the play is pretty middle-brow stuff. Payne is expert at dropping enough physics into his plays to fool theater critics who majored in Elizabethan drama into thinking he’s being profound. The other half of “Incognito” is about Albert Einstein. Well, Albert Einstein’s brain, to be exact. Payne bases both stories on real-life events. Einstein’s brain was dissected and kept by Dr. Thomas Harvey, and a granddaughter, Evelyn Einstein, had reason to believe she might be the genius’ daughter instead. She asked for DNA testing.